We had gray winter landscapes (and wardrobes!) 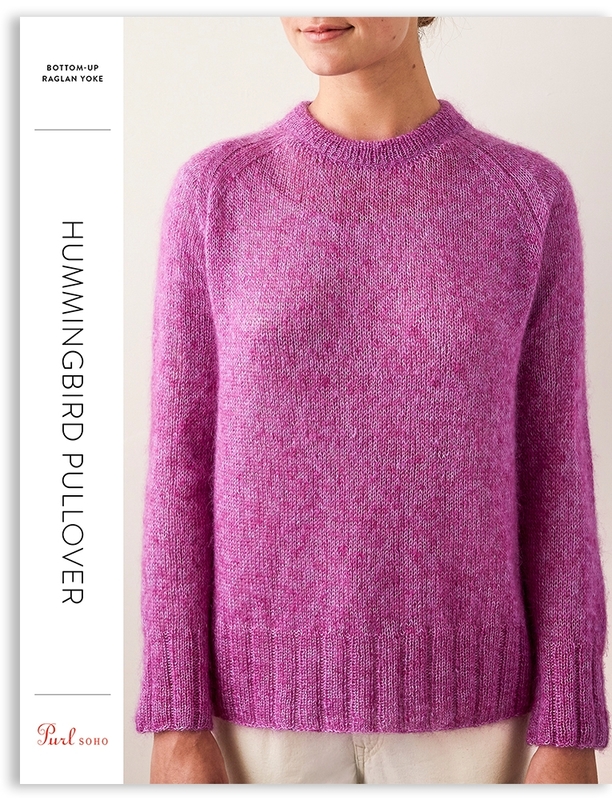 in mind when we created our Hummingbird Pullover, named for its bright colors, feathery texture, and lightness of spirit! Brilliant color and texture taking center stage, we kept this construction classic. 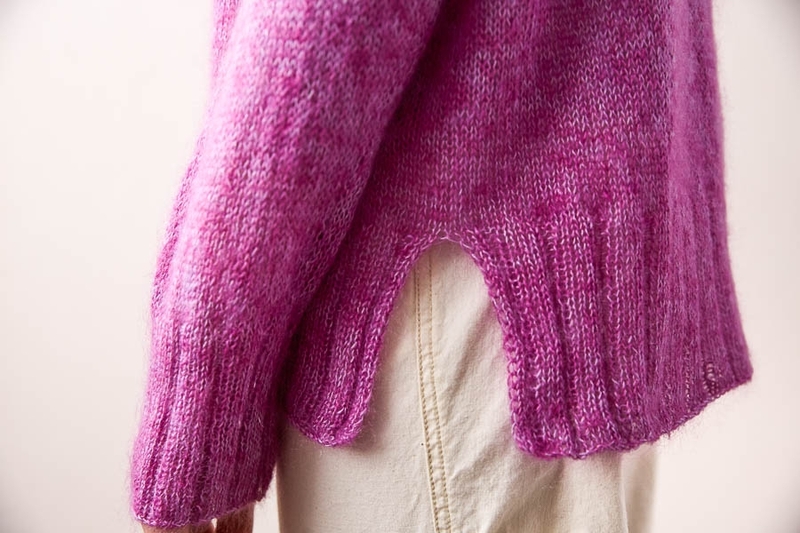 The Hummingbird Pullover knits in the round from the bottom up with raglan-shaped shoulders. The resulting fit is loose and roomy, light and fluffy, perfect for layering over tees or thermals. Along the way you’ll find little thoughtful details: a split hem along the bottom ribbed edge, architectural shoulder decreases, and a neckline that folds under to the inside for a soft, rounded finish. 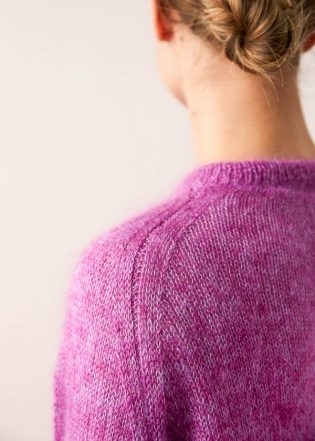 Simple in construction and design, the Hummingbird Pullover really takes flight with our mohair-silk Tussock. 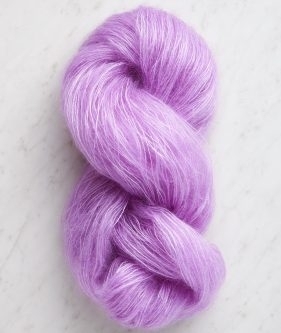 A fine laceweight with substantial body and bloom, you’ll hold two strands of Tussock together for a fun, lofty fabric. Go all-in on one color, or like we did, choose two to create visual depth and a distinctive marle. Whether you’re a color maximalist or tend to keep to neutrals, the Hummingbird Pullover is downy, soft, and feather light, a rare bird! Purl Soho’s Tussock, 60% super fine kid mohair and 40% silk. Color A: 4 (4, 5, 5, 6, 6) skeins. We used Alpine Phlox. Color B: 4 (4, 5, 5, 6, 6) skeins. We used Bright Thistle. 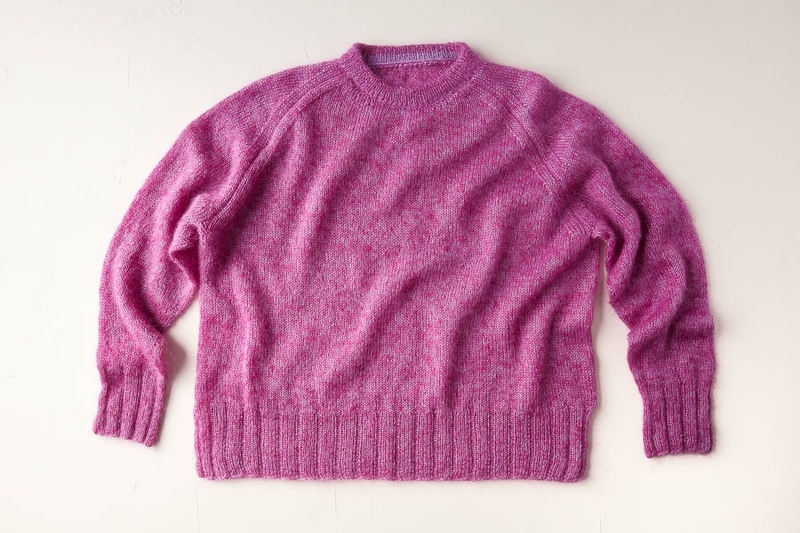 SAMPLE: The sweater pictured here is size 44¼ inches with 10 inches of ease. The Hummingbird Pullover Pattern is available for purchase as a PDF download only. love it, but not in Ravelry? that’s where I save pattern ideas. may have to buy it anyway. Thanks for writing in! This lovely pattern is now on Ravelry! Lovely color and texture! I am a little wary of holding two yarns together. Do you have another yarn recommendation that may meet gauge? Thanks so much for the kind words! I would suggest substituting Mulberry Merino or Season Alpaca as they should knit up to the correct gauge when worked as a single strand; however, we don’t have anything that will match the airy, soft halo of Tussock at that gauge! Holding two yarns together may sound intimidating, but it’s really quite easy so I do hope you will give it a try! How soon for the cardigan? Thanks for writing in! We do not have a cardigan version of this sweater but I will certainly pass your suggestion along to the design team! Thanks for reaching out! 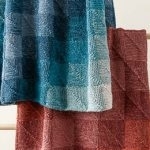 In an effort to reduce our impact on the earth, we are now offering some of our patterns only in digital download form. If you are ordering your yarn from us, we would be happy to print out a copy for you! Just drop us a note in the order comments asking for a printed pattern and we will include it in your shipment. I love this pattern and was wondering if Orange Pekoe and Squash Blossom would be a good combination. Thank you for reaching out. This sounds like beautifully cheerful combination – I say go for it! 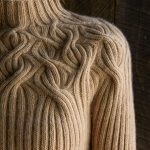 This sweater looks gorgeous! Tussock is such a beautiful yarn, especially with two different shades held together— I am partway through an Elementary wrap in Anjou Pear/Wild Guava that is a lovely peachy rose. Would you consider doing a post showing more swatches of various color combinations in Tussock? 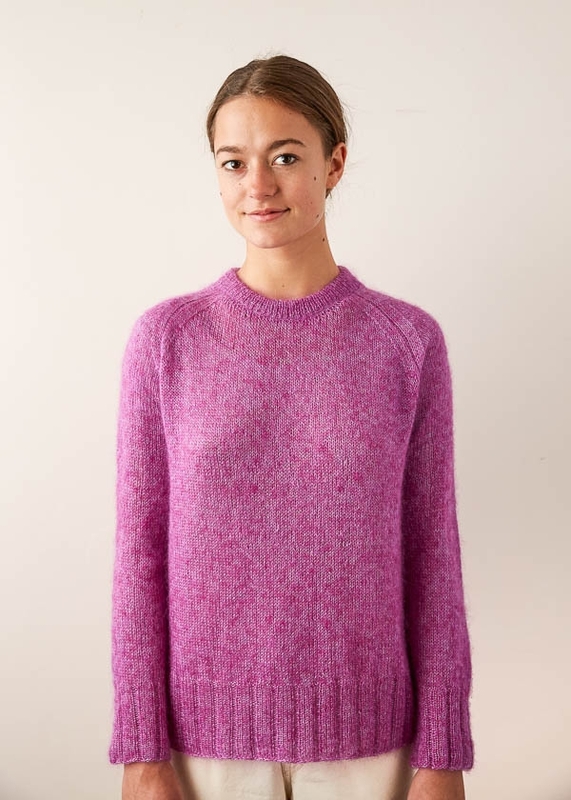 There are some on the Elementary wrap page but since this sweater is more of an investment in number of skeins, it would be neat to see more color possibilities before ordering. Thank you for reaching out and for all of your kind words! I love this suggestion and I will certainly pass it along. I completely agree with Megan! I’m personally curious about some of the blue/green combinations (e.g., are Bright Verdigris and Blue Lagoon together a bit over the top? Or how might one of those look with Blue Fjord?) – I see one combination of Blue Lagoon and Balsam Green on the Elementary Wrap page, but would like to see some other options before taking the plunge with such a big online purchase/investment. Hi, While I love Hummingbird done in Tussock it is simply too fine for me to knit with. Do you think Cashmarino Bloom would work? I know the Cashmarino is a larger gauge yarn. What do you think?? Thank you for reaching out! While the gauge is actually pretty close for the main body of the sweater the neckband goes down to use US 2 and US 3 which would be a challenge to make CMB work with. It will also have a very different texture than with the Tussock and will not be as open and will loose its drape, but the gauge should work out fine. I would check out our Classic Hemmed Crewneck which will work beautifully with CMB. Thank you so much for the kind words – I’m glad to hear you are enjoying Tussock so much! You can use the magic loop method for the sleeves on this sweater; however, I would be very careful not to tighten too much when transitioning between needle halves. Since Tussock is so fine and doesn’t have much stretch, if you over tighten the edge stitch it could be quite difficult to slide it back up onto the needle tip on the next row. Otherwise, if you prefer magic loop to double points, this is a great option! 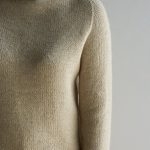 I am a beginner–intermediate knitter — have experience in basic cables, lace, colourwork, chevrons and knitting in the round. I have not yet tackled a sweater and am looking for one to tackle. Would this project be suitable? And if not, can you recommend one? I do not like super-bulky/chunky knits. Thanks for reaching out! 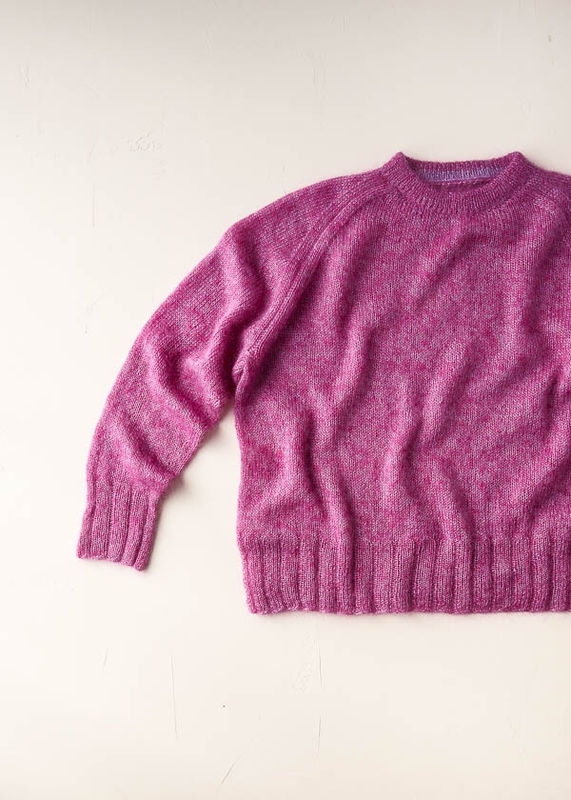 It sounds like this sweater would be a great first garment for you! 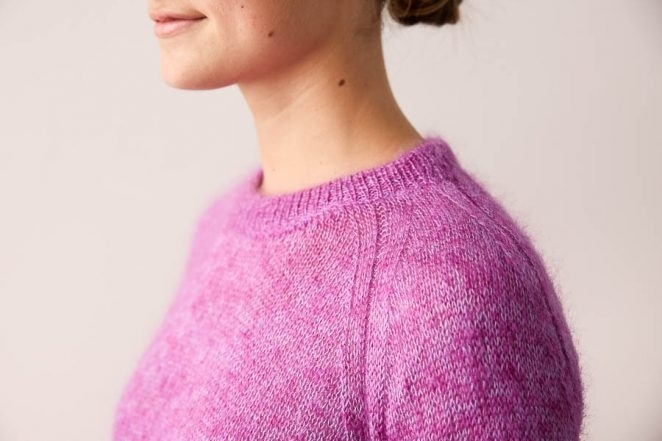 The fabric is very light weight and airy, and the knitting is mostly ribbing and stockinette in the round, with some simple decreases and a few short rows to shape the yoke and neckline. We are always here to help if you have any questions, so I do hope you will give it a try! I agree about the color combo swatches, especially for those of us who are purchasing online from a distance. I’d love to see some more colors together! On another note, I’ve tried subbing two laceweights held together and it turns our humongous. Is the sizing meant to be very “generous”? I just succumbed to Tussock when you put it on sale so now I will see if it works better. Thanks for writing in, and I’ll be sure to add your voice to the suggestions for more color swatches! 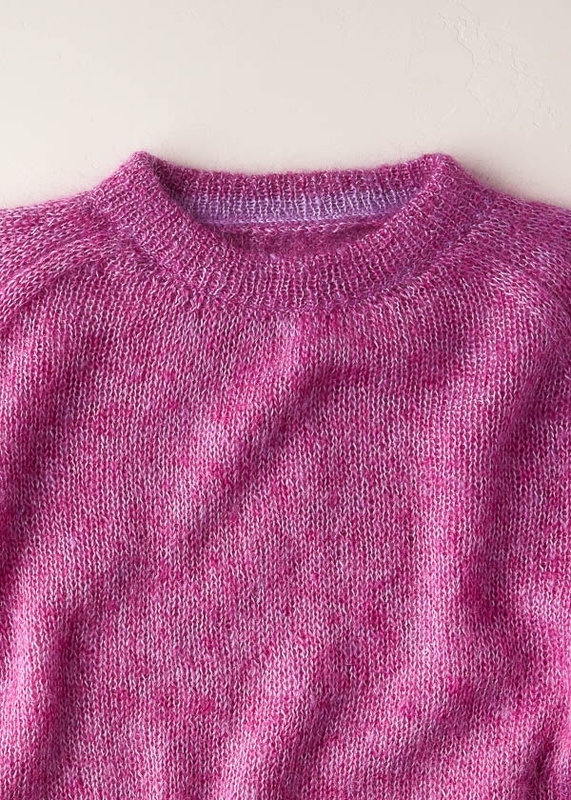 While Tussock is a laceweight and we did design this sweater with 9-12 inches of positive ease, it sounds like you might have run into a gauge issue. It’s always recommended to knit a gauge swatch, especially when substituting yarns, as everyone’s knitting is a bit different and even yarns that are listed as the same weight can vary a bit or behave differently on the needles due to construction or fiber content. I do hope that you’re happy with your sweater in Tussock! I’m also trying to decide on color combinations before purchasing my Tussock yarn. I love the Lightning Yellow, but would like an opinion on whether to pair it with Heirloom White or Blue Lagoon. Obviously, Blue Lagoon would probably make this sweater really stand out, but I think the two colors really go well together versus the white which would make the yellow more muted. Thanks for reaching out! You are correct that Heirloom White would tone down the neon vibrancy of Lightning Yellow a bit, but since you are pairing it with a neutral, the overall effect would still be mostly yellow. Adding Blue Lagoon instead would result in a very different dominant color! The marl of yellow and blue would be much more pronounced and the higher contrast would really stand out. Either option would look look lovely, it just depends how much of a statement you want to make with your sweater! Awesome, thanks for the feedback, Julianna! 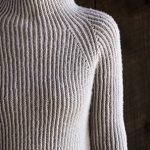 can this be knit using Linen Quill. what changes would i need to make in the gauge? i want to use just a single strand throughout. thank you for your help. Hi and thanks for writing in! 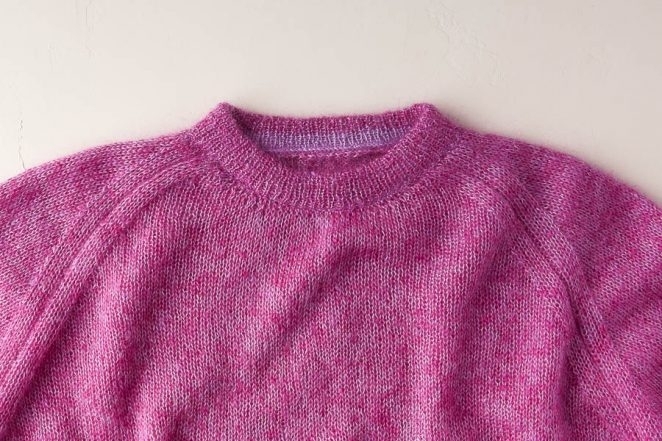 While it is possible that you could match the gauge of this sweater using a single strand of Linen Quill, you would have to knit a gauge swatch or two to determine what needle size to use and the fabric may be a bit open or loosely knit. If you prefer a denser fabric, you may want to consider our Lightweight Raglan Pullover which is designed for Linen Quill. Can I please clarify a section of this pattern. When I’m dividing for the front & back, do I put the 4 knit stitches plus the previous 8 stitches on the stitch holder, or only the 8 stitches. Sorry I’m a little confused. Thanks for reaching out! You will be putting 8 total stitches on a holder – the four you just knit, plus the four before the marker. I’m a knitter with limited skills! I’m at the point in the pattern where I knit the Raglan Decrease Row every other round. My question is: What is the stitch for the rows in between the Decrease Rows? This is a great question- the rows between your decrease rows are just knit rows!